The NFPA Certified Wildfire Mitigation Specialist Program (CWMS) was created in 2017 after discussions with fire service and forestry professionals at the federal, state, and local levels. The CWMS credential offers professionals whose work involves wildfire hazard mitigation, the ability to demonstrate that they understand hazard mitigation measures, planning and preparedness strategies, public education practices, and wildland fire science. Gain the recognition you deserve as an expert in your field with this specialist certification. Certification holders also receive an NFPA certificate that highlights their accomplishment. It is the candidate’s responsibility to obtain the reference materials needed for study purposes. NFPA 1141, NFPA 1143, and NFPA 1144 are available for purchase by clicking on the related links. The remaining reference materials are available at no cost at the links provided. 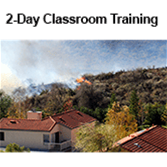 Take Assessing Structure Ignition Potential From Wildfire 2-Day Classroom Training with Certificate of Educational Achievement to learn how to analyze wildfire risks to structures and provide actionable advice to property owners.